On Saturday October 26, 2013, The Maryland Cybersecurity Center (MC2) was among the exhibitors at the Society of Women Engineer’s Invent it! Build it! Expo-the final event of their annual conference, held in Baltimore, MD this year. The Expo hosted representatives from both national and local STEM (Science, Technology, Engineering and Math) organizations and outreach programs that provided resources and materials about programs, groups, best practices and more. Middle school girls and parents, as well as local educators, community leaders, and other conference attendees, were able to participate in hands-on activities and learn about the different opportunities available for female students who are interested in STEM. Representatives from MC2, a first-time exhibitor, engaged with attendees about their upcoming summer camps and workshops, as well as the opportunities available at UMD for high school and college students. At the MC2 table, students could also use cipher wheels to crack a code, which demonstrated an activity that the students would do at the CyberSTEM Camp for middle school girls. 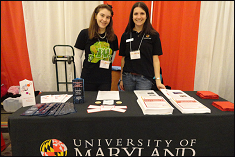 MC2 was joined at the Expo by UMD’s recently announced Maryland Center from Women in Computing. The new Center was also able to promote their upcoming summer programs, in addition to their opportunities for undergraduate females studying computer science. Also in attendance was UMD’s Women in Engineering Program, who had staff and undergraduate volunteers promoting their educational programs and doing interactive engineering demonstrations for the girls. Collectively, the University of Maryland presented their strong emphasis on encouraging females to pursue STEM interests through offering a diverse array of programs.